New Delhi: To celebrate the 100th anniversary of Mahatma Gandhi’s first Satyagraha in Champaran against the forced cultivation of indigo, Navdanya along with other civil society organizations, farmers, economic democracy movements, universities and state governments will undertake on 13 April a 10-day pan-India pilgrimage, a Satyagraha Yatra, to promote Gandhian philosophy of Swaraj (sovereignty), Swadeshi (indigenous) and Satyagraha (force of truth). The Satyagraha Yatra, pilgrimage for Seed Freedom and Food Freedom, will be a statement in the name of the force of truth against any form of colonization, including the one which is present today, perpetrated by agrichemical corporations and their attempt to colonize our seed, food and freedom everywhere. Not just India, but the entire world is facing a new wave of greed and corporate deceit. While honest hardworking individuals are battling hunger, malnutrition, poverty and disease, corporations are stealing away their food, employment, homes and dignity. The Yatra will be the occasion to renew our commitment to the Earth, to save and sow the seeds of freedom. People’s Assemblies will be held at every stage of the journey. The looting of India in the 1600s by a single corporation, East India Company, was responsible for the death of countless millions of people. Corporations today are again trying to recolonize our country with the collection of rents and royalties on our seeds, our food, our incomes, and even our minds and privacy. It is the higher laws of protecting the freedom of the Earth and defending the interconnected freedoms, rights and responsibilities of all her beings that give us the “compassionate courage” to challenge petty and unjust laws and policies which are rooted in greed and lead to violence. This system of violence and greed is overtaking humanity and undermining the notion of democracy and sovereignty. This same system, with its chemical and poison cartel, has driven more than 300,000 farmers in India to suicide. In front of corporations’ boundless power of corruption, true justice for this planet and its people will come from not becoming part of their poison economy and poison industry. Navdanya hosted the first Peoples Assembly at the Monsanto Tribunal in the Hague in October 2016 and held a second Peoples Assembly in November in remembrance of the 32nd anniversary of the Bhopal gas genocide and to hold Dow and DuPont accountable. 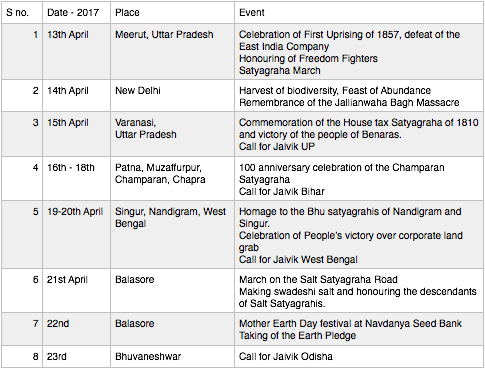 During this month’s Satyagraha Yatra, People’s Assemblies will be held all over India beginning April 13th with the aim of both, making corporations like Monsanto-Bayer accountable for their crimes and, together with the people, laying the foundation of a New India, a Jaivik (agro-ecology) India 2047 and a New Vasudeva Kutumbhakam, a new Earth Family. This means the building of an alternative to the killing economy of the Poison Cartel, an alternative based on Jaivik Kheti (agro-ecology based farming), Annapurna (Living Economies based on participatory local/ artisanal production) and Annam (Food as Health). We have the ecological alternatives in this amazingly rich land which has given the world biodiversity, where the knowledge of that biodiversity is still with us. We can grow rich, nutritious, poison free food for twice India’s population. By stopping the haemorrhage of our scarce incomes on costly GMOs and toxic chemicals we can double farmers incomes and end the cycle of debt. Through our biodiversity, through poison-free farming, we will create an India that is free of corporate rule. India had its first independence movement in 1857 and the second one, which brought us political freedom, in 1947. Now we begin the third independence movement to be free of corporate rule of every kind, including the rule of the poison cartel. 30 years ago Navdanya began its journey for Seed Freedom and Food Freedom through Swadeshi, Swaraj, Satyagraha, our self-organizing capacity for true freedom, our self-making capacity without poisons, and our ability to say no to violence, to poisons and to brute force. Now, 30 years from the centennial of India’s freedom struggle in 2047, we recommit ourselves to continue the defence of our freedoms and the shaping of a poison-free, corporate-free future. Join us in this Jaivik Kranti to together sow the seeds for a disease, debt, malnutrition, hunger, farmers’ suicide free Jaivik India 2047. 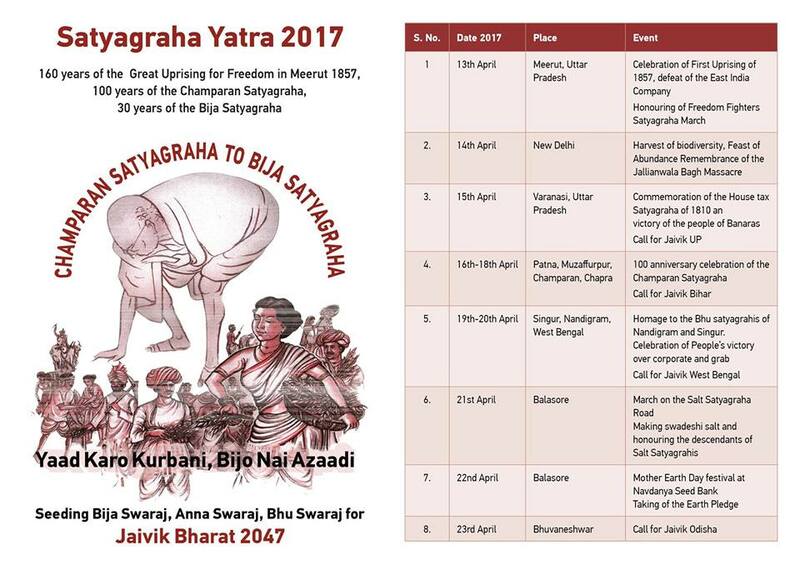 The Satyagraha Yatra will start on 13 April in Meerut where the First Independence movement against the East India Company began in 1857. Benares will be the next stop to celebrate the 1810 movement against the British imposed house tax, and on 17 April the pilgrimage will be in Champaran, the day Gandhi started his Satyagraha against the forced cultivation of Indigo. We will join the valiant communities of Singur and Nandigram who stopped land grab through the land Satyagraha (Bhu Satyagraha), and after paying homage to those who participated in the Salt Satyagraha of 1930 in Orissa, we will conclude the Yatra on 22 April, Mother Earth Day, at the Navdanya community Seed Bank in Orissa where the Seeds of Hope Campaign in India began.